It's obvious that humans are fundamentally different from other animal species. It's not so easy, though, to identify the traits that make Homo sapiens so special. Scientists realized long ago that other animals make tools, play jokes and even have a sense of justice and altruism  all things we once thought were unique to our species. Now a paper in the journal Current Biology has added another behavior to the list of what other animals share with us  and this one isn't quite so charming. After years of field observations in Uganda's Kibale National Park, John Mitani of the University of Michigan and several colleagues have concluded that chimps wage war to conquer new territory. "We already knew that chimps kill each other," says Mitani. "We've known this for a long time." What scientists didn't know for sure, at least in cases in which groups of chimps banded together to kill others, was why. One hypothesis, advanced more than a decade ago by anthropologist Richard Wrangham, was the idea of territorial conquest; circumstantial evidence from both Gombe and Mahale national parks in Tanzania bolstered the theory. In Mahale, for example, male members of one group mysteriously vanished, and another group then expanded into what had been their land  suggestive but not conclusive. In Gombe, an existing group dissolved into civil war, resulting in killings and land takeovers. But it's hard to say what the casus belli was and thus impossible to know if territorial combat was a key motivator. Mitani, for the first time, has gathered direct evidence of deliberate warfare. 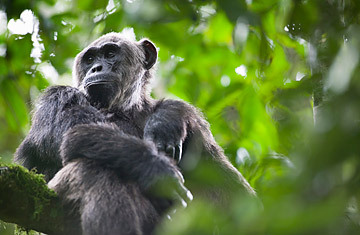 From 1999 to 2008, he and his colleagues observed 18 chimp-on-chimp killings, 13 of which took place in the homeland of a single neighboring group. Then last year, says Mitani, "all of a sudden [the aggressors] made this big land grab," moving into the territory where the 13 victims had lived. "It isn't rocket science," he says. "We put two and two together and got four." What's especially chilling about the observation is that the murder rate appears to be so high. The anthropologists couldn't be certain of how big a band the victims belonged to because, unlike the aggressors, they weren't used to a human presence and thus couldn't be accurately counted. But even a conservative estimate suggests that the death rate is significantly higher than you would see in war between human hunter-gatherer groups. Mitani isn't oblivious to the lesson some people might draw from the study. "Invariably, some will take this as evidence that the roots of aggression run very deep," he says, and therefore conclude that war is our evolutionary destiny. "Even if that were true," says Mitani, "we operate by a moral code that chimps don't have." Besides, he points out, the Pan troglodytes chimps he studies are one of two subspecies. The other is called Pan paniscus, also known as bonobos, and, says Mitani, "the latter, as far as we know, aren't nearly as aggressive with respect to intergroup relations. Yet they're equally close to us." That means that if we're wired for warfare, we're wired for peace too. Ultimately, the route we choose is still up to us. The original version of this article mistakenly stated that John Mitani was affiliated with Michigan State University. He is in fact affiliated with the University of Michigan. See the top 10 new species of 2009.